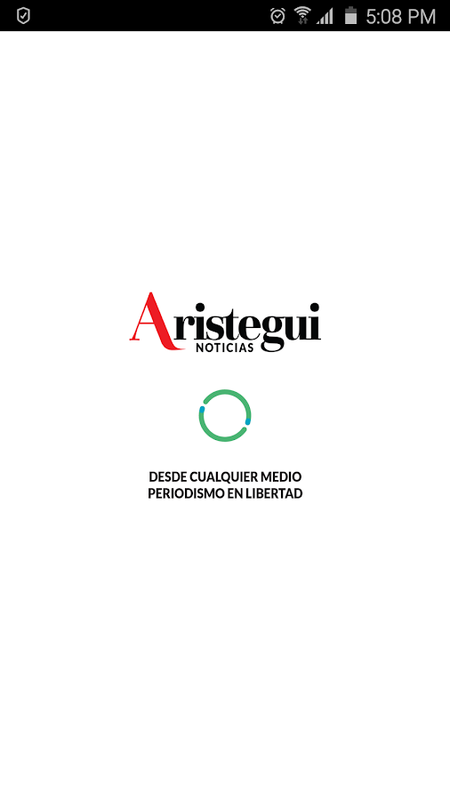 AristeguiNoticias.com es un portal de noticiassobre México y el mundo con información, fotografías, vídeos,reportajes especiales y exposiciones multimedia con los temas demayor impacto y relevancia noticiosa. 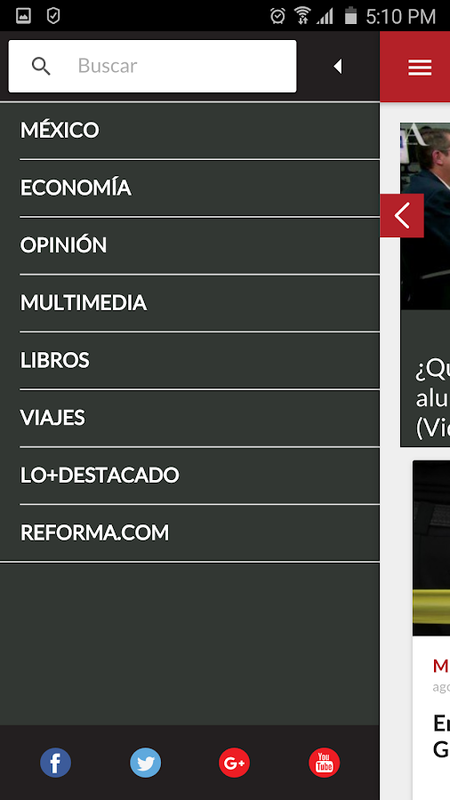 Con la edición para Apps de Android ampliamos nuestros espacios decomunicación con una sociedad cada vez más demandante,crítica y exigente y nos permite refrendar nuestro compromisoprincipal con usted : ejercer "desde cualquier medio, periodismo enlibertad". AristeguiNoticias.com isa news portal for Mexico and the world with information,photographs, videos, special reports and multimedia presentationswith topics of greater impact and relevance news. With the edition for Android Apps we expand our opportunities forcommunication with a demanding increasingly demanding society, andallows us to review and endorse our primary commitment to you:exercise "from any media, journalism freedom." 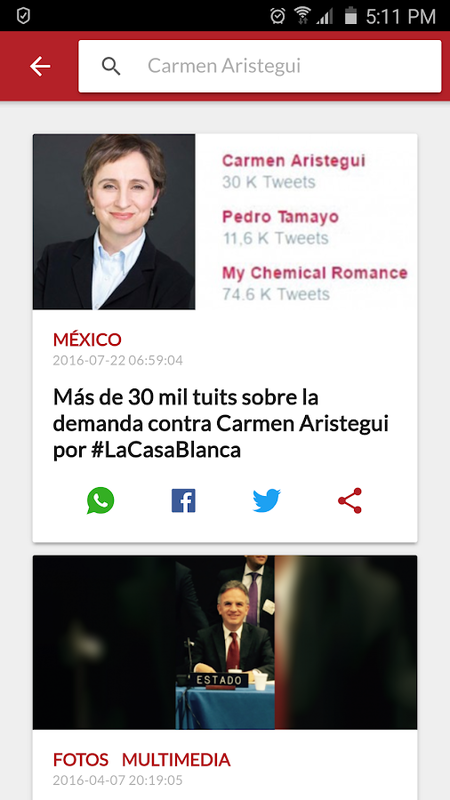 AristeguiNoticias.com es un portal de noticiassobre México y el mundo con información, fotografías, vídeos,reportajes especiales y exposiciones multimedia con los temas demayor impacto y relevancia noticiosa.Con la edición para Apps de Android ampliamos nuestros espacios decomunicación con una sociedad cada vez más demandante,crítica y exigente y nos permite refrendar nuestro compromisoprincipal con usted : ejercer "desde cualquier medio, periodismo enlibertad".AristeguiNoticias.com isa news portal for Mexico and the world with information,photographs, videos, special reports and multimedia presentationswith topics of greater impact and relevance news.With the edition for Android Apps we expand our opportunities forcommunication with a demanding increasingly demanding society, andallows us to review and endorse our primary commitment to you:exercise "from any media, journalism freedom." Aristegui en Vivo es un programa en vivo de noticias sobre México yel mundo con información, fotografías, vídeos, reportajesespeciales y exposiciones multimedia con los temas de mayor impactoy relevancia. Puedes seguir la transmisión de lunes a viernes apartir de las 8:00 hrs (CST).Con la edición Radio Online ampliamosnuestros espacios de comunicación con una sociedad cada vez másdemandante, crítica y exigente y nos permite refrendar nuestrocompromiso principal con usted : ejercer "desde cualquier medio,periodismo en libertad".Aristegui Live is a live news about Mexicoand the world with information, photographs, videos, specialreports and multimedia presentations with topics of greatest impactand relevance.You can follow the broadcast Monday through Fridayfrom 8:00 am (CST).With Radio Online edition spaces expand ourcommunication with an increasingly demanding society, critical anddemanding and allows us to endorse our primary commitment to you:exercise "from any media, journalism freedom". O aplicativo UOL - Notícias em Tempo Real foi feito para você quequer se manter atualizado e bem informado! Notícias da sua região,do Brasil e do Mundo. Informação rápida e completa com a melhortecnologia que o UOL pode oferecer. Alertas e NotificaçõesPersonalize alertas e receba notificações em tempo real dasprincipais notícias. Assuntos Variados Acompanhe o trânsito,previsão do tempo, dicas de viagem, turismo, cultura, saúde,educação, moda, estilo de vida, cinema, música, celebridades,profissões, negócios e muito mais. Bastidores do Esporte Fique pordentro das novidades do UOL Esporte e do Futebol. Leia sobrecontratação de jogadores para o Campeonato Brasileiro, Resultadosdos Jogos, Placar da Rodada, etc. Com Juca Kfouri, Mauro Beting,PVC (Paulo Vinícius Coelho) e outros. O Melhor Conteúdo OnlineTenha acesso ao conteúdo das principais agências de notícias, comoEstadão, BBC, Reuters, AP, DW, Bloomberg, ANSA, AFP, Valor Online eEFE. Para enriquecer e variar ainda mais a sua leitura, oaplicativo UOL - Notícias em Tempo Real conta com a alta qualidadedos parceiros: Folha/F5, ESPN, Omelete, Caras, Vírgula, Band,RedeTV!, Olhar Digital, Notícias da TV, A Tarde, Gizmodo, JovemPan, Opera Mundi, CGN, NE10, Congresso em Foco, Jornal do Tempo,Tribuna do Ceará, Na Telinha, Paraná Portal, JC Online. Além disso,aqui você também tem acesso a conteúdo traduzido de revistas ejornais internacionais, como The New York Times, Der Spiegel, ElPaís, Slate e Prospect. Fácil de Usar Com visual intuitivo, o menudo app reúne as principais áreas do UOL: Notícias, Esporte,Entretenimento, Estilo de Vida e VivaBem. Quando quiser, marque asnotícias para ler depois e consulte através da seção “Ver Depois”.Compartilhe sem dificuldade onde preferir: LinkedIn, Facebook,Twitter, Whatsapp, etc. Participe! Quando puder, conte-nos o quantogostou! Nós do UOL, desejamos a você uma ótima experiência! The UOLapplication - News Real-time is for you who want to keep up to dateand well informed! News from your region, Brazil and the World.rapid and complete information with the best technology that canoffer UOL. Alerts and Notifications Customize alerts and receivereal-time notifications of news. Miscellaneous issues Follow thetraffic, weather, travel, tourism, culture, health, education,fashion, lifestyle, movies, music, celebrities, professions,business and more. Backstage Sports Stay on top of news from UOLSport and Football. Read about signing players for the BrazilianChampionship, Games Results, Score Round, etc. With Juca Kfouri,Mauro Beting, PVC (Paulo Vinicius Coelho) and others. Best OnlineContent Have access to content from leading news agencies, such asESP, BBC, Reuters, AP, DW, Bloomberg, ANSA, AFP, EFE and ValorOnline. To enrich and further vary their reading, UOL application -News Realtime has the high quality of the partners: Sheet / F5,ESPN, Omelette, Faces, Rod, Band, RedeTV !, Look Digital, TV News,the late, Gizmodo, Jovem Pan, Opera Mundi, CGN, NE10, Congresso emFoco, Newspapers Time, Ceara Tribune, on the small screen, ParanáPortal, JC Online. Also, here you also have access to contenttranslated from international magazines and newspapers such as TheNew York Times, Der Spiegel, El País, Slate and Prospect. Easy touse With intuitive visual, the app's menu brings together the mainareas of UOL: News, Sports, Entertainment, Lifestyle and VivaBem.When you want, check the news to read later and see through the"View Later" section. Share easily anywhere you like: LinkedIn,Facebook, Twitter, Whatsapp, etc. Join! When you can, tell us howmuch he liked! We the UOL, we wish you a great experience! Con Noticias Libres podras acceder a lasnoticias de medios de ámbito español sin tener que recurrir amedios pertenecientes a la AEDE. Incluímos los siguientesmedios:- El Diario- La Información- 20 Minutos- Público- Periodista Digital- Infolibre- Europa Press- Periódico Diagonal- Revista La MareaEsta aplicación surge del descontento ciudadano nacido a raiz dela nueva LPI que obliga a pagar un canon a CEDRO y los medios deAEDE por mencionar y enlazar sobre su contenido. Con la mismaqueremos demostrar que no es necesario acceder a estos medios paraestar informados, y a la vez participar en el movimiento "BoicotAEDE".La aplicación está en evolución constante, por lo que siconocéis algún medio más nacional NO adherido a AEDE y queréis quese incluya, dejadlo en los comentarios.La aplicación ha sido creada a través de la api de APPYET. Lainformación mostrada en la misma es propiedad de los propios mediosque la proveen, accesible a través de sus RSS.With Free News you canget news Spanish media field without resorting to means belongingto the SAFE. We include the following means:- The diary- The information- 20 minutes- Public- Digital Journalist- Infolibre- Europa Press- Newspaper Diagonal- Magazine TideThis application comes from public discontent born in the wakeof the new LPI forcing CEDRO pay royalties and media SAFE mentionand link to its content. With it we want to show you do not needaccess to the media to be informed, and also participate in themovement "Boycott SAFE".The application is constantly evolving, so if you know any morenational average NO SAFE adhered to and want to be included, Ileave it in the comments.The application created through the API APPYET. The informationshown therein is owned by the media itself that provide accessiblethrough its RSS. 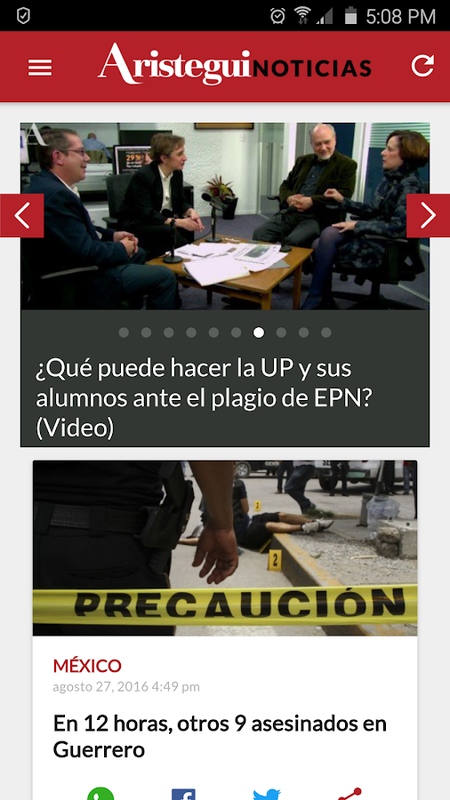 Mantente informado con Azteca Noticias para Android. La reinvenciónde Tv Azteca ha llegado a sus plataformas digitales. Entérate detodo lo que sucede en el mundo, desde la palma de tu mano. Disfrutade una experiencia única para ANDROID y vive en tiempo realnoticias de México, Estados, Internacional, Finanzas, Turismo,Tecnología, Educación, Salud, Sociedad, Entretenimiento y todo loque te interesa. Hoy las noticias son interactivas, descarga la Appy sumérgete en el mundo de la información. Stay informed withAzteca News for Android. The reinvention of TV Azteca has reachedits digital platforms. Find out everything that happens in theworld from the palm of your hand. Enjoy a unique experience forANDROID and live real-time news from Mexico, US, International,Finance, Tourism, Technology, Education, Health, Society,Entertainment and everything that interests you. Today the news isinteractive, download the app and immerse yourself in the world ofinformation. This is the app for Folha de S.Paulo, Brazil’s largest newspaper innumber of readers and subscribers. It offers all of the paper’scontent including news articles, columns and blogs, as well asvideos and photos. Folha de S.Paulo is the country’s mostinfluential publication, with a team of over one hundredcolumnists, and is known for its critical, nonpartisan andpluralist journalism. It was also the first publication in thecountry to offer content in real time over the web and to adopt anombudsman.